I have run in 4 pairs of Inov-8 shoes prior to the Roclite 305, the F-Lite195, Road F-Lite 155, Race Ultra 270 and the TrailRoc-245. I wanted to like them, but they were all way too minimal for my liking, with the exception of the Race Ultra 270, but unfortunately that one just did not work for my feet. The Roclite 305 thankfully has a lot more to it than some of the past models I have tested and on paper is a good fit for the mountainous terrain that I run daily. The Adapterweb system is a series of nylon lace loops integrated with the 4 mid foot overlays, providing an excellent locked down feel, while maintaining great comfort. The toe bumper is semi flexible rubber that integrates nicely, is non obtrusive, protective and reminds me somewhat of an approach shoe. The heel collar is a perfect height, has moderate padding and is comfortable. The heel counter is semi flexible, yet holds the heel in place nicely, aided by the X-Lock system to further add stability, heel lock and protection. The tongue is gusseted all the way to the very top lace eyelet, making for a nice booty like fit/feel and effectively keeps out dirt and debris. Fit is true to size and should accommodate a wide range of feet. The toe box rides a nice line of performance oriented lock down, with enough room for swelling, a little bit of splay and hours of comfort. The Powerflow midsole provides a very nice blend of cushioning and response, which, after some of the Inov-8 models I have tested in the past, is a very welcome relief. 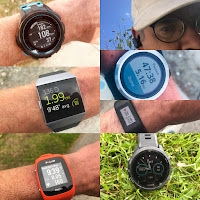 Cushioning is moderate and adequate for 4+ hours of running on moderate terrain, but perhaps a bit thin if running for that duration on really rocky terrain. The Meta Shank rock plate provides a reasonable combination of protection and flexibility, giving the Roclite 305 a very good sense of ground feel. The Roclite outsole with Tri C (3 rubber compounds) is probably my favorite aspect of the 305. The 6mm multi directional claw shaped cleats are aggressive and hook up very well on just about any surface, wet, dry, snow, off trail, mud, dirt, scree, talus, rock hopping, light scrambling, you name it. If you were running in mud more frequently however, a shoe with more pointed lugs, like the X-Talon would likely be more appropriate. The claws are directionally arranged back/forth for maximum traction. Below you can see the Meta-Flex groove across the center of the mid foot, which greatly aids in the flexibility of the 305. The Metashank adds great rock protection without being overly stiff. Torsional flexibility is appropriate for contouring over rocky terrain, without getting too worked over. Overall, I found the Roclite 305 to be a well rounded shoe for a wide variety of off road terrain, from smooth single-track, fire roads, technical trails, off trail, rocks, scree, mud, wet or dry. The lugs, though deep, are broad enough to handle a bit of pavement, but it is not a door to trail type of shoe. Though not the lightest shoe out there, I find the weight to be reasonable for all that the 305 offers and feels lighter on the foot than the weight would suggest. The 305 is quick and responsive and feels stable and secure on just about any terrain at moderate paces, but felt like when pushing fast in technical terrain, I was not completely confident. Though foothold is good, I noticed a bit of foot sliding (particularly the heel) inside the shoe when running fast on moderately steep trails and especially on steeper trails. I did not get any blistering, but my heel did get pretty hot and I kept this in mind for my daily shoe choice depending on terrain/distance. I would recommend the Roclite 305 for those Inov-8 aficionados looking for more protection and cushion on a wide variety of terrain, for those looking to train or race up to 50k, or perhaps even 50 miles if you don't necessarily prefer a maximal shoe. -.3 for weight. Though protective, there are other shoes out there with more cushion and protection in a lighter package. -.3 for foothold. Despite the X-Lock and Adapterweb, when pushed hard, my foot will slide some and I worry about blistering on steeper terrain. -.3 for flex on rocky terrain. I prefer torsional flex on rocky terrain, but the 305 has slightly too much in my opinion for prolonged use on rocks. Inov-8 Roclite 305 vs. La Sportiva Mutant (RTR review here): Very similar weight and performance, but the Mutant has a more secure upper resulting in better foothold and slightly better traction, particularly in the wet. Inov-8 Roclite 305 vs. La Sportiva Akasha (RTR review here): The Akasha has a softer, more cushioned ride for longer distances and better foothold security than the Roclite 305. The Akasha has better wet traction, but the Roclite 305 has the edge in mud, snow and looser terrain. 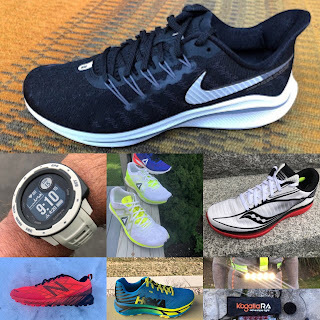 Inov-8 Roclite 305 vs. Saucony Peregrine 7 (RTR review here): The Peregrine 7 is lighter, more responsive, agile and has a more secure upper. The Peregrine also has and edge when it comes to traction on dry hardpack, but the 305 perhaps has a bit better all around and wet traction, as well as durability. Inov-8 Roclite 305 vs. adidas Terrex X King (RTR review here): The X King has better traction in any circumstance with one of the best outsoles of any shoe on the market, but the Roclite 305 is more breathable and has a more comfortable and compliant upper. The X King weighs a bit more, mostly due to the very thick and durable upper and feels a little less cushioned and less responsive than the 305. Inov-8 Roclite 305 vs. adidas Terrex Trailmaker (RTR review here): Very comparable in weight and cushion, but the Trailmaker has a bit better underfoot protection and an edge on traction. The Trailmaker is also a bit more quick and agile. The Roclite 305 was provided at no charge. The opinions herein are entirely the author's. I am a very big fan of this shoe. I agree that it could be improved in a few different areas - the shoe felt a little flat footed to me on my initial run which caused some initial calf soreness. Also, I've seen a little more wear on the outsole on my first few runs than I might have expected, though not a concerning amount. And finally,the shoes do seem a to be a little slow drying. I completely submerged mine in a creek crossing and it took several hours on an upper 80's day for them to completely dry out. However, I would rather have a more durable upper that is slower drying than a thin upper that could rip before the shoe wore out. The fit is not nearly as form fitting as I had anticipated based on what I had read. However, that is a positive for me as I've had to return more than one model of Salomons because of excessive narrowness, and I have not felt the sloppiness in the heel that you experienced, even with sizing up a full size, but I did use the extra lace hole to help lock my heel in. The midsole hits the sweet spot for me - responsive without being harsh, and the metashank rockplate works wonders on rough terrain. I would like to see this shoe lightened as well, but I feel like it's still a respectable weight overall for the amount of protection the shoe offers and I agree that it feels lighter on the foot than the specs would indicate. I would rather the shoe weigh what it weighs with the durable upper it has and rock plate, than have a thinner upper and no rockplate to reach the ~ 9 oz weight. You guys do a fantastic job with the reviews - I enjoy both the diversity of shoe brands and types reviewed along with the gear reviews. I always look forward to seeing a new review in my news feed. After a 1000 kilometres of trailrunning on the INOV-8 Roclite 305 I wrote my experiences down on my weblog (www.dutchtrailrunner.com).The trails I enjoyed where very much what I would call multi-terrain: ranging from easy going dry forest, wet grassland, muddy fields, scree slopes to challenging large boulder fields. So besides distance I can also say something about the best terrain for these shoes.